The SCI “Tor Caldara” (IT6030046) is located along the Latium coast, between Lavinio Lido di Enea and Lido di Cincinnato in the town of Anzio (RM). Tor Caldara is a Natural Regional Reserve since 1988, it is managed by the little town of Anzio and directed by the WWF. Town of Anzio, environmental office. The SCI is characterized by regular borders and its surface has a quadrilateral shape. It overlooks the Tyrrhenian sea. This SCI has a surface of 44 hectares, with a middle height of 13 meters above sea level (minimum height 3 meters maximum height 25 meters). This SCI is an area which preserves the natural balance of the town of Anzio. Until 60s this area was a camping ground while nowadays it is an extremely important area for the biodiversity. It is characterized by extractive actions, sand dunes, clays and gravels. This SCI is one the most important Latium geosite for its geopedological characteristics. The stratigraphies show sedimentary successions characterized by marine regressions. 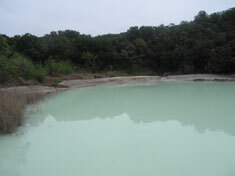 In this area there are sulphur springs which modified this land in fact it is characterized by the presence of large areas without vegetation. The cape of Tor Caldara is characterized by a stratum of clay and sand and it is subject to the percolation of meteoric water which creates geological instability on the coast. The erosion of the coast is also heightened by the building of bridges and sea walls which alter the flow of currents and the sandy shore storing.